“I started breaking out on my chin after not having broken out in years. My skin texture is normally smooth, but now it’s bumpy and I have a mixture of small, red bumps, whiteheads and cysts. I’ve been breaking out consistently for the past 3-4 weeks. Help!” These were the text messages I got back in August 2018 from Heather Maffei (@hmuir), the beauty director at Real Simple and Health Magazine. She told me that she had been struggling with a sudden onset of adult acne and was having trouble getting her normally clear complexion to behave again. 1. Have you recently changed up your skincare routine? Heather: Once I started breaking out, I started using Differin. I was also recently on a beach vacation for a week slathering on SPF 50. 2. Have you recently had any professional treatments? Heather: Yes, I had a micro-needling treatment done a month ago where they put EGF (epidermal growth factor) on my face afterward. 3. Have you recently started using a Clarisonic brush or something similar? Heather: No, I don’t use a Clarisonic. 4. Have you recently changed your diet? Heather: No changes to my diet. 5. Any recent changes in lifestyle (for example: a new workout routine, more frequent traveling or moving)? Heather: Not that I can think of. 6. Have you been under more stress than usual? 7. 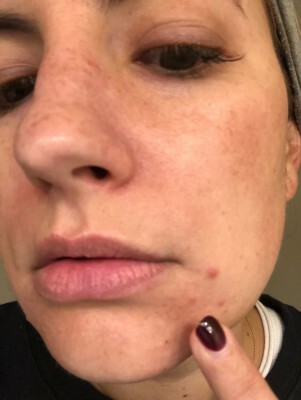 How many new, active blemishes are popping up each day? Heather: I get 1-3 new breakouts every day. Some are small, red bumps and some are much bigger, like cysts. 8. Do you usually get breakouts around your menstrual cycle? Has your cycle been regular (If not, this could be a sign of a hormonal imbalance)? Heather: I usually never break out around my cycle, and everything has been regular. 9. Have there been any changes to your birth control? 10. Have you recently started taking any new medications? 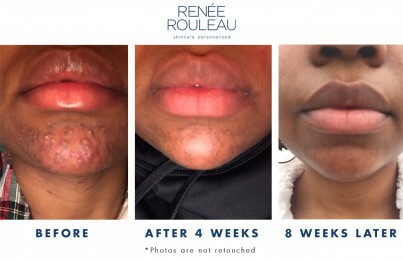 The micro-needling/EGF treatment was likely the main trigger for her sudden chin breakout. Micro-needling and EGF are designed to stimulate the metabolism of your cells, which is good for aging skin because it sends the cells signals to act “young” again. The problem for Heather is that her skin is already young, which also means her metabolism is already active. Stimulating it further with something as active as micro-needling may have backfired and disrupted her barrier. This more than likely threw everything out of whack for her young skin. Pro tip: be cautious and have a thorough consultation with a skin professional before doing such active treatments on your skin. Wearing heavy sunscreen on newly treated skin may have made things worse by blocking her pores. Some sunscreens (especially the water-resistant kind you use at the beach) can be notorious for clogging pores. Pro tip: I recommend wearing a sunscreen like Weightless Protection SPF 30, which is specifically formulated to soothe skin and not clog pores. Trying to correct her sudden breakout with Differin may have hurt more than it helped. Differin is an over-the-counter retinoid (vitamin A) gel for treating acne. It works by stimulating cell turnover and can be quite drying initially. This can cause problems for skin that doesn’t get many breakouts and isn’t very oily to begin with. Differin can cause newly dried cells to sit on the top of the skin and trap dirt and oil. This can actually lead to more breakouts while the skin adjusts. 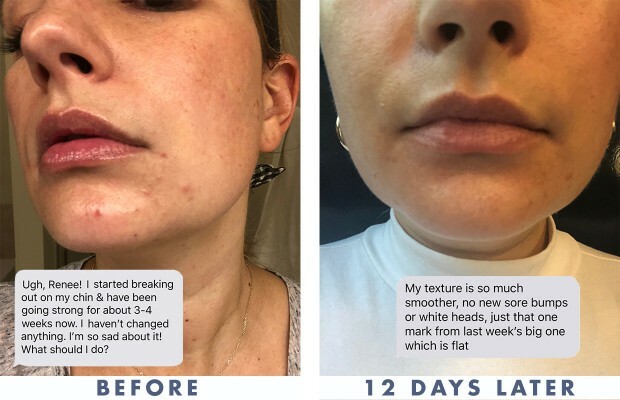 In Heather’s case, the combination of something as active as Differin along with a treatment as stimulating as micro-needling may have stirred up too much activity in her young skin. Note: Differin works well as a long-term strategy for controlling clogged pores and closed comedones in oily skin types. But if you don’t normally break out much and your skin dehydrates easily, Differin might not be the best strategy for you. In the case of Heather’s skin, this was especially true because her skin’s barrier was already compromised from the drying effects of Differin. Because of her job, Heather attends a lot of beauty events and wants to be able to wear makeup, so I advised her to go makeup-free on weekends or whenever possible. 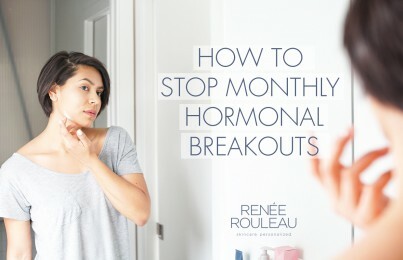 When you suddenly start breaking out as an adult, the issue is often temporary so it’s critical that you don’t start treating your skin like a teenager with acne would. This means using acne products only where breakouts occur and avoiding overly harsh or drying ingredients. Here is the starter routine I put together for Heather. As she moved through different stages of healing, I tweaked her routine slightly. 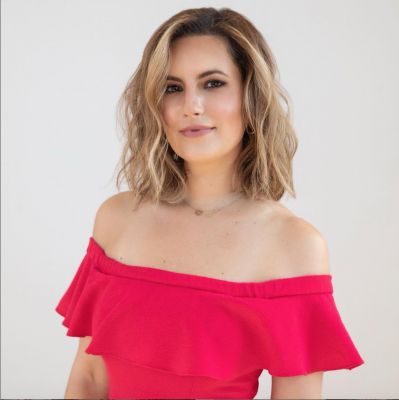 When Heather reached out to me, my first priority was to immediately put out the “fire” and calm her inflammation in order to stop new breakouts from appearing. Once we got this under control, the next goal was to strengthen her skin long-term and reprogram it to start behaving again. Since Heather’s breakouts were isolated to the chin and jawline, I wanted to focus the more active ingredients in this area while using soothing and hydrating ingredients everywhere else. Heather was so excited about the results of my customized treatment plan that she wrote this article in Health Magazine about how she got her adult chin and jawline breakouts under control. When you suddenly break out, it can be difficult to pinpoint the exact cause. Regardless, the important thing is to treat it correctly. If you can, start by consulting with a trusted skin care professional who can help you put a plan of action in place. Using the right products in the right way should help return your skin to a better balance so less (or ideally no) breakout activity occurs. I hope you found this post helpful. If you don’t have access to a trusted skin care professional in your area, I encourage you to schedule a virtual consultation with one of our expert estheticians. Don’t go it alone! Lastly, if you saw my recent post on Instagram you know that we are building upon the success of our Rapid Response Detox Masque and coming out with some new products focused on treating adult breakouts fast. Stay tuned!